SM2/c Joe Moll and Ens. Jack Fitch on board Nicholas after rescuing Helena survivors, 6 July 1943. Joe Moll was signalman in Nicholas, ’42–45. 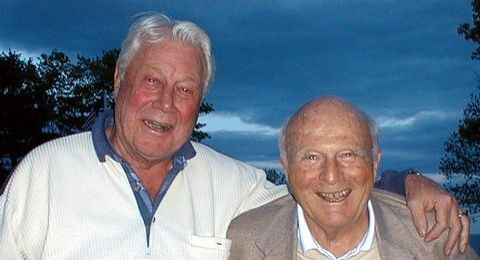 Joe Moll and Jack Fitch met once after World War II: at Jack’s summer home in Maine during the Nicholas reunion at Portland in 2002, where they recreated the 1943 photo and also discovered that both of them had been saved by their watchbands. USS Nicholas, DD 449, was lead ship (Task Group 36.1) in battle formation followed by USS O’Bannon, DD 450, with cruisers Honolulu, Helena and St. Louis, in that order. Bringing up the rear were USS Jenkins, DD 447, and USS Radford, DD 446. Contact with the enemy was made, with an exchange of gunfire and torpedo attacks. Upon completion of first phase, a 180-degree turn was made, with the Radford now in lead and Nicholas bringing up the rear. I was standing on the starboard side of bridge when I observed a darker object two points off the starboard bow. Reporting this to Capt. Hill, he directed me to have it illuminated. A.V. Lufkin SM2/C was manning our carbon light on the flying bridge, pointing the light in that direction and within a short sweep (through our binoculars) was a bow sticking up above the water with No. 50. I knew it was the Helena and at the same instant Capt. Hill said, “My God, it’s the Helena.” He relayed this information to Admiral Ainsworth, who instructed the Nicholas to stay on station and rescue survivors. While serving aboard USS Greer, DD 145, I had training in boat rescue, which paid off in the Atlantic during convoy duty. (Greer was first USN ship attacked September 1941.) Without hesitation (and with my binoculars) I grabbed the signal gun (built like an oversized shotgun with a 4-inch diameter tube). Before leaving the ship I told Lufkin I would use NK (–.–.–) as a call sign and his reply should be one dash (–). This would enable us to make a direct course back to the ship with no wasted time. The whaleboat was manned by Bob Ahlers, Cox, L.J. Arceneaux, E1/C, R. Clark S2/C, and myself. As we approached the survivors, I instructed them that we wanted those that were injured into the boat first. Loading the boat with both, we contributed our life jackets to those without any. On the night of July 5–6, 1943, Rear Admiral W. L. Ainsworth’s Task Group 36.1, cruisers Honolulu, Helena and St. Louis escorted by DesRon 21—Nicholas (flagship of Capt. McInerney), O’Bannon, Radford and Jenkins—met a force of ten destroyers in a night action during which the Helena was sunk by a “long lance” torpedo. While the rest of the American force retired, Nicholas and Radford were detached to rescue survivors. Together the two ships picked up 745 cruisermen while also breaking off lifesaving efforts three separate times to engage enemy destroyers. They then returned to their Tulagi base after daylight in one of the Nick’s fastest runs of the entire war. Nicholas and Radford both received the Presidential Unit Citation for this action. I sent NK and received a dash—so far, so good. Everything was going great. Returning to the ship, the cargo nets were already draped over the side of the ship. Those that could climbed aboard, and those that couldn’t were lifted. Before shoving off, I told the boatswain mate to pass a line for towing. We shoved off (instructing Ahlers to make a wide sweep) where we located many survivors who had swam away from the Helena and had avoided the oil slick, loading the boat once more with the injured first. Joe Moll with bent finger (see penultimate paragraph) in 2000. Once more signaling NK (there wasn’t any answer). Checking our compass heading with Ahlers, I knew the Nick should be within that area. I signaled once more and there was no reply. Figuring she had moved to a new position, I signaled to the west (Kolombangara Island area). I swept the area with NKs (we received an answer) . . . it was a torpedo wake passing alongside our boat . . . followed by gunfire, with shells splashing all around us. We could hear all the familiar choo choos passing overhead. Within a few moments, there was a tremendous explosion from where the torpedo originated. It lit up like a barn afire. Using my binoculars and hearing gunfire, I observed another ship. She was burning also. There was a 3rd ship, and it appeared to be running away at about 15 or 20 knots. Minutes later I received a dash (I hadn’t sent NK). The Nick had returned on station and again we went alongside. Lufkin was at the well deck and briefed me lightly as to what was going on. He said the Radford had been assisting since after our first trip and that our other whaleboat was broken down and out there somewhere. We were ready to shove off once more when Ens. Jack Fitch became part of our boat crew. I told him about the torpedo wake and splashing shells around us. He said we had diverted the Japs’ attention away from the Nick and Radford, where they had been great targets. We had empty rafts in tow and approached more survivors. Again she broke off to intercept another Jap ship, taking it under gunfire. It appeared she took a hit or two (it was said she was looking for Jap survivors). With the Nick back on station we pulled up alongside. Once the boat was unloaded we left the rafts alongside. And once again we started back out and had cleared the ship about 100 yards when Capt. 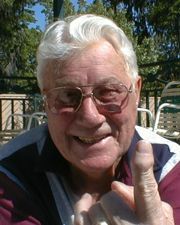 Hill, using his megaphone, told us to return to the ship, that a Jap air attack was to strike at daylight. Returning to along side the ship, the crew scrambled up the cargo nets followed by Mr. Fitch. The ship was backing down during this time to avoid anyone still in the water from going thru the screws. And before I realized it the cargo nets had passed me by. There were knotted lines tied to the stanchions on the foc’sle down to the water level. I made a grab for one and had climbed about six feet when the ship started to move forward, rapidly picking up speed. My hands were slippery and somewhere during the rescue I had injured my left index finger and this made it very tough climbing. As the bow plunged forward it would go up and down and the waves were hitting my feet and legs below the knees, bouncing me into the hull. As the ship gained speed and leveled out I had climbed to within six to eight inches of the deck. I was exhausted. My left hand was at the top of the line. I had a wristwatch on and had replaced its leather band with a Speidel stretch band from the Norfolk ship’s store while serving aboard USS Greer, DD 145, back in early 1941. Meanwhile, after Mr. Fitch got back aboard he went up to the bridge, and from what I gathered later, Capt. Hill asked him, “Where’s Moll?” The word was passed thru headsets. Ed Schumacker GM3/c and his crew from the No. 1 5-inch gun mount left their station and started a search for me on the portside. We had traveled quite a distance from our rescue point and now, without my life jacket, my greatest fear was going thru the screws. I was about to let go . . . I had been hollering for help. I was losing hope, when all of a sudden someone grabbed my forearm, I was slipping thru their grip when they engaged the Speidel. It stretched and I held on with every bit of strength I could muster. Then other hands grabbed me also and pulled me up and over the top rail . . . I still had the line clutched in both hands! If it weren’t for Ed and his gang, I would not be here today. I’m a very lucky guy. At the well deck they had a makeshift clean up station where I cleaned myself up and then went up to the bridge. There a lot of handshakes and hugs . . . plus tears were shed. A few photos were taken. I am enclosing a photo of Ens. Fitch and myself. I’m the one with the binoculars. ComAirSoPac (Vice Admiral Aubrey Fitch) was Mr. Fitch’s father, and that’s probably why the Jap planes never got to us. I remember air cover on our way back to Tulagi. Entering Tulagi, all ships present manned the rails and cheered very, very loudly for the Nick and Radford. We transferred our group to the USS Honolulu. Looking back, I’m very happy the blinker gun played an important part in the continuing rescue mission. Our whaleboat was able to tow our other boat and rafts to safety. There was no fire burning in the oil slick during our part in the rescue. It would certainly have created a problem for everyone concerned. By the way, my injured left index finger now bends outward at about 30 degrees at the first joint. I guess calcium deposits took over many, many years ago. In the photo, I’m wearing a hooded jacket with the hood down. I protected the binoculars inside the jacket when not using them. And as a matter of fact, I still have the jacket in one of my closets . . . oil stains and all!!! P.S. I can only recall that our other whaleboat was manned by coxswain K.R. Anderson, and that they were left behind and rejoined our ship several days later.